Solo, 2-day hike with sleepover at Kinsman Shelter, and North and South Kinsman on Sunday morning. Just got back from overnight to North and South Kinsman. Spend night at Kinsman Shelter. Get this: started at 2pm on Saturday! Did peaks today with 4″ new snow. Glorious! 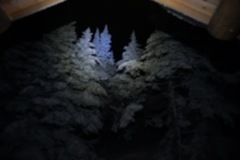 Night was fine except I was not cozy warm, just warm enough with tarp hung inside shelter. Thinking of tent. I almost brought my Sierra Designs 9-pounder less fly, but I chickened out because it seemed too heavy. I think the tarp IN THE SNOW is still nice, but I chose the shelter when I reached it instead of sleeping outside in the snow. Now I am thinking of a Tyvek bivy bag—just need to find a piece of Tyvek. Snowy all the time. I didn’t think that the snow would be early, but the trip up had flurries. Reached the Shelter after 1 hour to the Lonesome Lake Hut and then 2 hours up Fishin’ Jimmie Trail. Hung tarp. Cooked a great evening meal after getting warm in my parka and lower bag. Boil-in-a-bag meat and rice, previously cooked and heated in the tea. Used Mike Pineault’s suggestion of pouring the hot water in a nalgene bottle and placing it in the sleeping bag—stayed warm half the night. In the early am, awoke to get a couple interesting pictures, but they are blurry. I will need to use a tripod next time. Morning came, and I had a fine hot breakfast, keeping the food warm in my insulated Nalgene cover. Started out on the fresh trail before 8am. Did North Kinsman and continued to South. Back to the shelter junction before 10am, then back down. I startled a young woman around a bend in the trail; she did NOT expect anybody! Pics here. The camera worked fine. Love the tilt screen. Actually had it in my parka pocket all night, and didn’t even feel it. Battery did fine; down to about 60%. No effects of the cold. 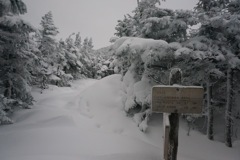 Summary: ~11 miles, snowy on both days, 2pm start on Saturday, Sunday breaking trail to peaks. Simply gorgeous with new snow.